Read-out Instrumentation Signpost: New automation on-line periodical! InTech Focus is an e-magazine to cover fundamental automation topics, applications, and strategies to enhance automation professionals’ on-the-job success. It will be a great source for "inside knowledge from industry thought leaders and subject matter experts in an easy to read digital format." 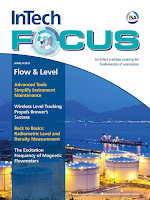 The inaugural issue of InTech Focus, which is from the ISA stable of automation publications, covers flow and level instrumentation. "From real-world case studies to strategic maintenance tips and expert analysis of the new tools, this issue has everything that today’s process professionals will need to safely and efficiently enhance the value of their organizations."